Bill Gallo was a New York Daily News fixture for over half a century, covering sports graphically and in prose for an appreciative sports-mad city. 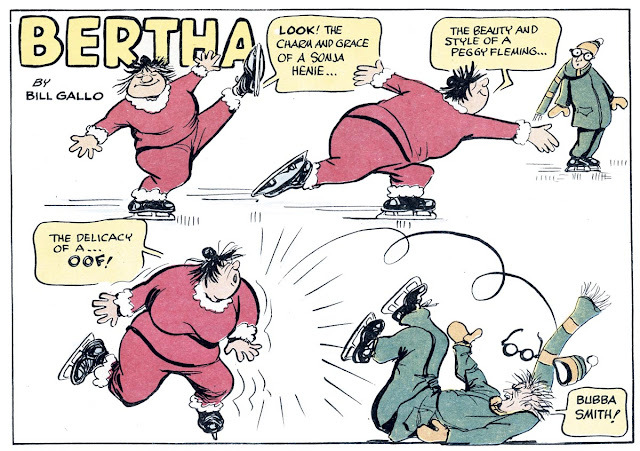 Gallo's most famous and enduring creation as a sports cartoonist was Basement Bertha, a frumpy yenta whose abiding passion was sports. Gallo's realm was almost exclusively the sports pages, but in the early 1970s he was prevailed upon to add to his responsibilities a Sunday color comic strip using the character. The strip was like the other Sunday News homegrown features in that it never ran every week, but appeared only when there was a hole that needed to be filled in the Sunday section. 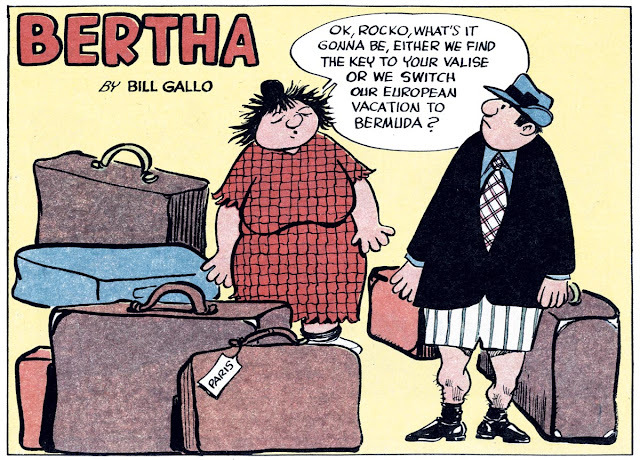 The strip was titled simply Bertha (not Basement Bertha as reported in the World Encyclopedia of Cartoons), and I don't have definitive start and end dates for it, but can only report having examples from 1972-1975. I was all hepped up to try out the new addition to newspapers.com of the Daily News to get you definite dates on Bertha, but I was crushed to find out that their Daily News archive don't include many Sunday comics sections for the early and mid-1970s. One thing to consider is that this rare filler may have appeared additionally in the "Home" vs "National" editions of the Sunday comics. I've found over the decades there were occasional discrepancies based on ad placements. If you ever have questions pertaining to the NY Sunday News comics, ask away. I've indexed their contents from the mid 1960's to 1988 (with 1989 to present sitting a few feet away, unindexed) as well as at least half of the 1940's and 1950's and a third of the 1930's. Thank you very much for the information, Doc V! I've been told that you've shared a lot of your NYSN research on Facebook, but since I'm not a member of that clan I haven't been able to take advantage. I'd very much like to pin down the running dates on all these fillers, and was jumping with joy when the News was announced to be available on newspapers.com. Alas, it turned out to be a terrible disappointment. Allan, I'll look up those fillers for you tonight. One thing memory tells me is that Bumper to Bumper was a prime example of a filler that appeared in one or the other local vs national editions of the NYSN. And I believe it worked both ways, sometimes it appeared in the local and not national, and sometimes the reverse! So this is very frustrating in developing an all-time index. I literally need a complete collection of both versions to nail it down 100%! I also believe that at many, many points in time, the two versions were identical, and I have both versions from certain weeks in the 1940, 1950's and 1960's that show no difference. My Facebook group devoted to this particular Sunday comics is called "The New York Sunday Comics History Group"
Beany - The earliest I have is the very first paper to appear after the newspaper strike. The section is undated but is probably right before 4/7/63. My blog post on the strike has a scan of it..
Bumper to Bumper - Earliest I've seen is 2/5/56, latest is 6/24/62. This filler was used quite often seitched out with ads in National vs Home editions. This Man's Army - Earliest I have is 3/27/57. Latest is 4/24/66, after not appearing for about 4 years! Tweety-Pie. Earliest I have is 9/27/64. Latest is 2/25/79, after not appearing for almost 5 years! The Zanities - I have 3 total appearances, 2 in 1949 where the strip is actually titled "The Zanities of '49". Earliest is 5/15/49, then 10/23/49, then out of the blue as "The Zanities", on 1/16/55. Thank you, thank you, thank you for all that information!! I've updated my data and added edits to the posts on this blog with your info. The piece on your blog about the Daily News strike was fascinating. I made a comment there with some information. Oddly enough, I have all three of The Zanities, two as tearsheets, one as original art. Weird. Louie is supposed to have run until 1976, so I guess the News gave up on it a little early ... unless Hanan dropped the Sunday early. Can I assume you meant 3/26/72 (not 1974) as the end date of Laugh-In? Yes, 3/26/72 on the last Laugh-In. My error.